I was one of those people whose spice cabinet was packed with old bottles of spices that had been purchased for one recipe or another and then never touched again. I moved away from home when I was 19 with a kitchen starter kit that had been assembled with odds and ends from the kitchens of several family members. Along with the old, dented (but still very functional) pots and pans, strange, rusty, kitchen gadgets that looked like they were from the 1930’s, and a case of Top Ramen, courtesy of a good friend, I ended up with several jars of spices. Who knows how long they had been sitting in someone else’s cabinet before I acquired them. Well, I put them in my spice cabinet, used them occasionally, and kept adding to my collection whenever I wanted to make a recipe that called for a spice that I didn’t own. Over the years, I kept carrying these things around with me…house to house, town to town. I mean, spices can get pretty expensive so I didn’t want to just throw them out! Fast forward 10 years and here I was in Sicily. Fresh herbs everywhere at the markets, dried herbs and spices sold in bulk, restaurants serving food that tasted fresher than anything that had ever come out of my kitchen. I started to pay attention to what was happening around me. People were shopping for the day or the week, not for the entire month! Herbs and spices were being purchased regularly, in quantities to be used quickly. I started to notice things in local kitchens too. Refrigerators here were small, pantries were stocked with canned tomatoes, not 20-year-old jars of spices and boxes of overly-processed, ‘instant’ foods. I looked in my cabinets, looked in my pantry, looked in my fridge, and realized that it was time for a change in my kitchen! I took the plunge, I cleaned out my pantry and spice cabinet, I dumped all the dried herbs and spices that I had been collecting for 10 years, some of which were at least that old before I ever got a hold of them. I honestly wouldn’t be surprised if I had some spices in my cabinet that were older than me. In fact, I’m almost positive that was the case. After close examination, I realized that I couldn’t even smell a difference between the majority of them! I tossed them all and tried not to think what my grandmother would say about wasting things that had cost so much money. I kept many of the little glass jars because I noticed that most of the spices here were sold either in bulk or in little plastic packages. I figured that I could re-use many of the jars by getting creative with some white sticky labels and a black marker. It was exciting! My kitchen was a clean slate and I felt like I was embarking on a new adventure! And this time, I decided, I wouldn’t purchase a spice for one recipe and then never use it again. If I were going to try something new, I would learn about it, experiment with it, and keep using it. Ok, this is where The Spice House comes in. A couple summers ago, I bought a book on grilling. Elizabeth Karmel’s book, Taming The Flame. There are several cookbooks that have profoundly influenced the way I cook and this is one of them. I’ll write more later about why this particular book is so important to me but for now I’ll just say that Karmel introduced me to The Spice House through her book and I’m very grateful for that! The Spice House grinds and blends their spices by hand, in small batches. They are as fresh as you could want and they are offered in bulk quantities, which keeps the prices down. You can buy spices whole or ground, in shaker jars, shaker jar refills, or larger bulk quantities. You can even purchase the empty glass shaker jars separately. I certainly don’t buy all of my spices from The Spice House. There are certain things I can buy here that are just as good and cheaper. But there are other things that I can’t find here or that aren’t as good quality as I can get from The Spice House. So, I purchase some herbs and spices at the outdoor markets (dried oregano and bay leaves, for instance), some from the grocery store (whole nutmeg, sea salt, kosher salt, black peppercorns, etc) and some from The Spice House (granulated garlic, smoked paprika, chili powder, the list goes on and on). I also use many more fresh herbs now than I used to and I love to experiment with different combinations of fresh herbs and dried spices. Maybe you aren’t ready to completely empty your spice cabinet like I was. But if you are anything like the person I described at the beginning of this post, maybe it’s time to at least take a peek in some of those long unopened jars. Smell them, taste them, are they really going to add anything special to that next dish you prepare? If not, get rid of them! This post is going to have to be a two-parter because as I’m writing this, I’m realizing how much the way I cook has changed over the last three years. Cleaning out my spice cabinet and learning to use fresh herbs was just the beginning. There have been so many small, simple changes: Using fresh ground pepper rather than the ground stuff out of a can, using kosher salt and sea salt in place of iodized salt, grating nutmeg by hand, toasting whole spices such as cumin and grinding them myself in a coffee grinder I have reserved just for spices. I could write a page about each little change I’ve made because each one has made such a huge, huge difference in the food that I make. But, I will spare you for today! Instead, I will continue this at a later date and for now just let you go check out The Spice House. Even if you are lucky enough to live in Chicago, Evanston, or Milwaukee and can visit a store in person, the Web site is a must visit! You can learn all kinds of new information about spices, there are forums where you can ask spice-related questions, and there are tons of customer-submitted recipes. You can browse through spices alphabetically by name, by category, or by cuisine. If you love Greek food, for instance, and want to know what spices you might use to flavor your own Greek-influenced creations, just look under Greek cuisine and be inspired 🙂 Same goes for Cajun, Caribbean, Scandinavian, Indian, Spanish and Thai, just to name a few! And, as if their product quality and informative Web site weren’t enough, The Spice House customer service is wonderful and the shipping is amazingly fast! And believe me, being an overseas military spouse, I know a thing or two about online shopping! I had intended for this to just be a short post about my latest purchase from The Spice House but I guess I got a little carried away and I never even told you what I bought this last time! I guess I’ll just let you go there and find something on your own this time and later, I’ll give you a list of my favorite spices and spice blends 🙂 But there is one thing about my purchase that I have to tell you about! Along with a few spice refills, I purchased a book that is always advertised on The Spice House home page. The book is Herbs and Spices: The Cook’s Reference by Jill Norman. I have been wanting it since I first started shopping at The Spice House, but it’s not cheap. I finally broke down and bought it this last time and let me tell you, it is worth every cent! The book is beautiful, informative, and has moved to the top of my favorite cookbook list. Yes, it is more of a reference book than a cookbook but the last section is filled with wonderful recipes from around the world. I really can’t say enough about it! So, if you’re at all interested in learning more about herbs and spices and love gorgeous photography, put this book at the top of your wish list! It would also make a beautiful gift for anyone who enjoys cooking. 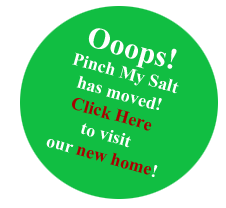 Subscribe to Pinch My Salt by e-mail! Next Entry: Happy Mother’s Day! I’m a big fan of Penzeys, but I just bookmarked this site to check it out. I love the idea of customer-submitted recipes. The Herbs and Spices book looks like it might be something I can’t live without too. Thanks. I always look forward to visiting The Spice House. It smells so good inside, and there is so much to choose from! Last time I went I got to choose between three or four different types of cinnamon. It blew my mind! I am due for a visit soon. Thanks for the tip about going to the website for more information about spices. It’s funny that you write about this topic … I’ve been mulling some things around in my head! Seriously though, my Mother a traditional Mexican woman has always lived by a certain code that canned or bottled spices were bad and if you want good and authentic tasting food you should always use all fresh ingredients or you might as well eat fast food! Thanks Nicole, I’m going to have to visit the spice house. I do live in Chicago, Nicole. The Spice House in person is every bit as wonderful as you might imagine. If I just pop in there for two minutes to pick up a couple of spices, I can smell spices on my clothing and skin the rest of the day. The people who work in the brick and mortar stores are insanely knowledgeable—many are students from a prestigious local culinary school. And the selection is mind boggling. Fresh herbs are indeed wonderful. But dried herbs and spices bring plenty of magic to the table too. Kalyn: I’ve heard many good things about Penzeys too but I’m really happy with The Spice House. The Web site is definitely worth a look just for recipe ideas and information about the spices. And the book is amazing! This may sound like a blasphemous question, what with you living in Italy now and immersing yourself in the wonderful regional cuisine, but do you use Herbes de Provence? That is one of my go to herb mixes in the dried department. Very interesting blog topic nicole. One thought comes to mind about spices–when we lived in Oregon and you had to hide them from Chris. He loves them but..makes those different creations. 🙂 And the fresher the better–what visuals you create of your life in Sicily–love it! Keep up the good work woman!! Steph: Hahaha…I forgot about Chris’ creations! Hope you did something fun for your birthday! I love my visits to Penzeys – getting to smell the spices makes me more willing to try something new when it comes to their ethnic mixtures. I’m going to bookmark Spice House now, though! I use to live right down the street from the original Spice House (http://www.spice-work.com/). It was great to pop in when I needed a spice and get just the right amount out of the huge glass jars lining the walls. A little trivia. . . the Spice House was started by (and the original is still run by) RuthAnn and Bill, the parents of Penzey’s founder Bill Penzey. oh just one step into the spice house and your olfactory system tells you that it must be heaven! They are such wonderful people. I ordered fresh-ground spices from them for years when I worked at Vosges Haut-Chocolat and now am a regular personal customer. Next time you are in Chicago – it is a must on your list! Hi 🙂 I came across The Spice House some time ago but could only gaze with longing from afar. I am in Singapore and they don’t ship overseas. I’m thrilled to find that in fact, they do! How did you persuade them to ship to you in Siciliy?